In Greek mythology nectar and ambrosia were magical substances which gave the gods immortality. The Greek gods lived on Mount Olympus, where they fed on ambrosia and drank nectar, sweet smelling substances which were served to them by Hebe the goddess of youth. Because they consumed these mystical victuals they did not have human blood. Instead, their veins ran with a mystical fluid known as ichor. There are many mentions of ambrosia in Greek mythology. It was said to have been brought to Olympus by heavenly doves. When the mortal Psyche married Eros, Jupiter gave her ambrosia. The mortal Herakles was also given ambrosia by Athena when he joined the gods on Olympus. Ambrosia was used not only as a food but also as a magical ointment. The hero Achilles' mother Thesis anointed him with ambrosia and passed him through fire to burn away his mortal parts. However, she was interrupted by Achilles’ father Peleus before she could put any ointment on his heel. As a result Achilles’ heel remained vulnerable to a mortal wound. This is the origin of the use of the phrase "Achilles heel" for a weakness which makes a powerful person vulnerable. But ambrosia was not a substance for any mere mortal. After tasting its delights on Mount Olympus, Tantalus wanted to share it with other mortals. He tried to steal some from the gods, and was punished to spending an eternity continually tormented (tantalized!) by hunger and thirst. Nectar was a divine drink which, like ambrosia, also gave immortality to anyone who drank it, and the gods would punish any mortal who tried to steal it. Whether ambrosia and nectar are purely mythological, or whether they do, in fact, have a basis in reality is an interesting question. Preventing a dead body from decay could be seen as a way of cheating the ravages of death and so giving the body immortality. And there are in fact instances in Greek literature where ambrosia is used as an embalming fluid. In the Iliad, for instance, Apollo uses ambrosia to anoint the corpse of Sarpedon. However, unlike modern embalming fluid, nectar and ambrosia are sweet smelling. In the Homeric hymn to Aphrodite, the goddess is perfumed with fragrant ambrosian oil. In the Odyssey, Menelaus and his men disguise themselves as seals by covering themselves with foul-smelling seal skins, and the goddess put ambrosia under their nostrils so that they can withstand the overwhelming seal odor. Because honey is a cleansing and a healing agent and is also sweet smelling, it is theorized that ambrosia and nectar may have been two kinds of honey. According to Mythweb ambrosia may have been a kind of cake made of honey, water, fruit, cheese, olive oil, and barley. It has also been speculated that nectar may have been honey wine or mead. But why would the gods condemn a mortal such as Tantalus to eternal punishment for stealing such commonplace items as honey and wine? It seems to me that ambrosia and nectar must have been something much more unique and special. They seem to have achieved mythological status because they were substances which gave mortals the power of gods. Perhaps the answer lies in the sacred mysteries and magic of shamanism. Shamanism is an ancient spiritual practice which can still be found in many indigenous cultures. It centers on a shaman who acts as a mystical go-between, a bridge between the community of the living and the spirit world, in order to foretell the future or heal the sick. To do this the shaman may enter a trance and become possessed by a spirit guide who speaks through him or her. Or the shaman may enter a dream state and journey to the spirit world. Many shamans were healers who used their intimate knowledge of the medicinal properties of local plants. 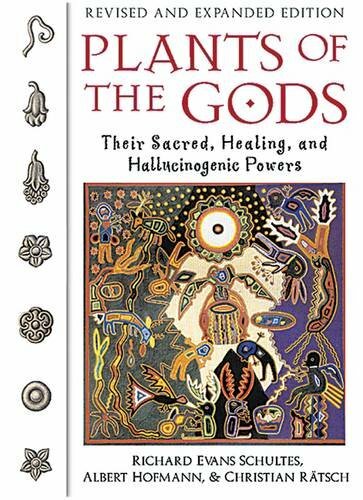 In some cases they also used psychoactive plants to expand their consciousness and to assist them on their spirit journeys. The native people of Mexico, for example, used peyote to help them to experience visions. Peoples of the Amazon basin drank ayahuasca both for its healing powers and because it gave the gift of clairvoyance and provided magical experiences such as the sensation of flying. A well-known old world hallucinogen is the red and white mushroom Amanita muscaria or fly agaric. It is reputed to have medicinal uses as an analgesic and for treating sore throats and arthritis, and may also be used as an insecticide. But the Amanita mushroom also has mystical connections with magic and enchantment. It is commonly incorporated into illustrations in children's fairy stories and is also known to have been used in pagan religious and shamanistic rituals. Consequently, some researchers believe that ambrosia may have been Amanita muscaria and that nectar may have been a liquid extract of the same mushroom. Scholars have also looked further afield for the origins of ambrosia and nectar. Greek belongs to the Indo-European language family which includes not only most European languages but also many languages spoken throughout the Middle East and eastward to India. The Greek word ambrosia, which means “no death”, comes from the same root as the Sanskrit word amrita which in Hindu mythology is also a food or drink which gave the gods immortality. Similarly, Hindu mythology also refers to soma, a nectar-like drink extracted from an unknown plant which was used in religious rituals in both Iran and India. Various potential soma plants have been suggested, including cannabis, Amanita muscaria and another hallicinogenic mushroom Psilocybe cubensis (pictured below) which grows in cow dung. Another possible source of soma is this plant. This is the Himalayan plant Sarcostemma acidum, which in Sanskrit is called somalatha or Soma creeper. Sarcostemma acidum is used to prepare soma juice which is used in Ayurvedic and Sidda medicine and is also still used in Hindu purification rituals in southern India. Another plant which has been suggested as the source of soma is ephedra, pictured here. This plant, called Ma Huang in Chinese, has been used in Chinese medicine for at least 3,000 years to treat colds, influenza, headaches, malaria and asthma. In Yadz, Iran ephedra is kown as homa, a name which has a possible linguistic relationship to the word soma. Zoroastrians in the area not only used homa in their rituals as late as the 19th century but also exported it to India. Although the word "nectar" is used to describe a deliciously sweet drink, and "ambrosia" describes a heavenly food fit for the gods, no-one knows what these substances actually were. They may have been common foods, but were more likely magical plants with healing properties which became associated with health, long life and perhaps by extension with immortality. Perhaps they were hallucinogens which helped mortals to commune with the gods. They may have been specific magical herbs, either one presented in this article or another unidentified, even extinct plant. Or perhaps they were generic words for any magical food or drink. This was truly a fun read. I love the sort of thing where we can speculate on the origins of certain tropes in history and mythology. Most excellent. Thanks, Vic! I really appreciate the positive comments.